One convent sister in particular has a strong passion for turning all of our imperfect fruits into creative preserves. 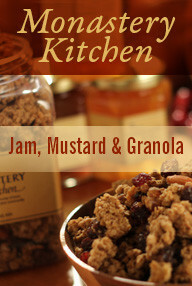 All summer long we have enjoyed a variety of jams and spreads on our breakfast toast, and occasional desserts. Plums, nectarines, peaches, apples have each in their season made their appearance in different forms. But perhaps the choicest of all was the rich creation that appeared this week and disappeared within days. Made with the last of our pears and laced with rich bourbon this superb pear chutney elevated an already elegant pork loin roast into a spectacular sensation. 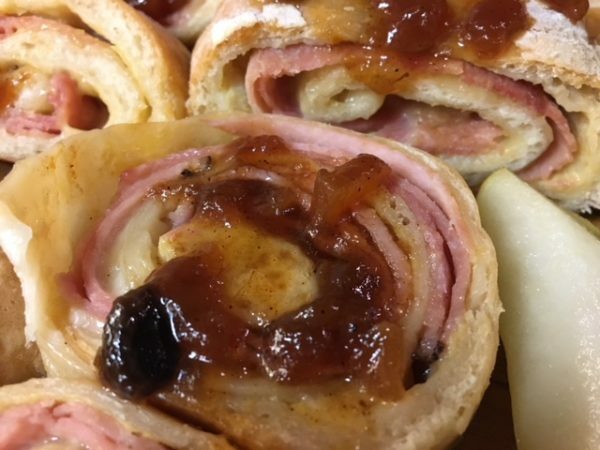 Yesterday’s lunch cook served it alongside of ham and swiss pinwheels—always a favorite just as they are on their own…over the top with this enhancement! It suddenly occurs to me that little jars of this would make choice Christmas gifts. Give it a try and see what you think. Combine all ingredients in a heavy pot. A Dutch oven or a cast iron pot works well. Bring ingredients to a boil, stirring often. Reduce heat and let simmer for about 1 ½ hours, stirring occasionally. Serve as a condiment on the side, warm on pork or chicken, or dress up a deli ham sandwich. Enjoy! 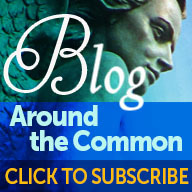 In the coming months, you will from time to time be treated to new recipes from “guest bloggers”. These are old and new friends — dedicated chefs and passionate voices who share our love of cooking. Our lives are enlarged as we welcome them and listen to their unique voices, share in their story and try our hand at their creativity. 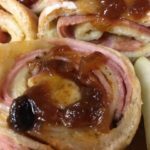 This week’s recipe is from a dear friend, Donna-Marie Cooper O’Boyle, a wife, mother, grandmother and EWTN TV host. She is an award-winning author of more than two dozen books, including Feeding Your Family’s Soul: Dinner Table Spirituality. She is the founder of the “Feeding the Body and Soul Movement.” More at DonnaCooperOBoyle.com. From Donna-Marie “Ahh, summertime! A time of well-deserved rest comes with a welcome change of scenery and in-season fruits. While making our plans, let’s not forget about our prayer lives. A change in schedule and eagerness to “get away from it all” might cause us to lose touch with our spiritual needs. We mustn’t let our prayer life go on vacation. So that family prayer continues to happen throughout summertime, we have to carve out time for it. Many inconveniences pop up in the heart of the family, and God knows we can’t drop to our knees to pray while taking care of pressing family needs. He also knows we are a work in progress, too. When our planned prayer time gets sabotaged or rearranged, we should try again to make it work. If we have done our best, He will surely reward us for persevering, and for training our children and grandchildren to develop committed relationships with Him. Wash berries (if using frozen berries, no need to wash! and mix with sugar (or honey), lemon zest, lemon juice, salt, cornstarch, vanilla and cinnamon (if using). Place in a buttered pie dish or 4 quart baking dish. Next, make biscuit dough topping. Whisk together flour, 3 Tbsp. sugar (or honey), baking powder and salt in medium bowl. Cut the butter into the flour mixture. Make a well in the center and stir in the milk (or yogurt) and beaten egg. Mix just until combined. Drop by spoonfuls on top of the berries. Bake for 30 min. or until well browned and berry mixture is bubbling and dough is cooked. Amazingly delicious when served warm with whipped cream, vanilla ice cream or even a spoonful of greek yogurt. Enjoy! Thank you, Donna Marie, for such a delightful summer recipe!